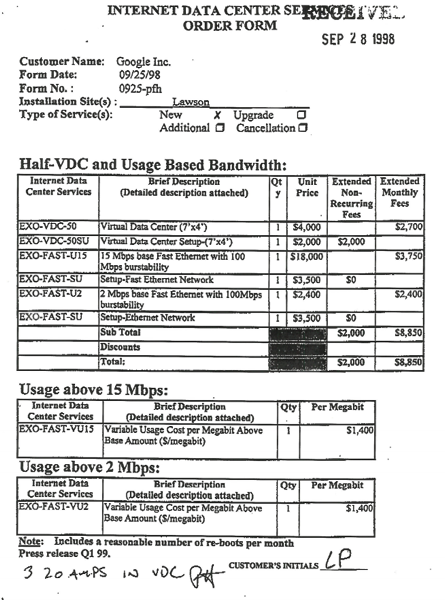 15 years ago (on Feb 1st, 1999) I first set foot in a Google datacenter. Well, not really -- in the Google cage in the Exodus datacenter in Santa Clara. Larry had led me there for a tour (I wasn't an employee yet) and it was my first time in any datacenter. And you couldn't really "set foot" in the first Google cage because it was tiny (7'x4', 2.5 sqm) and filled with about 30 PCs on shelves. a1 through a24 were the main servers to build and serve the index and c1 through c4 were the crawl machines. Maybe 15 years from Urs will share what Google’s bills look like now. Can you imagine what Google’s data center infrastructure will look like 15 years from now?